What is not being talked about following the conclusion of Jian Ghomeshi’s trial by either side is what is most important … men or women with low Respect Levels attract men or women with comparable Respect Levels … both of which take out their pain, frustration, and anger on those they connect with, especially those he or she believes they can control, manipulate, abuse, physically harm, and even kill. I know this because as a woman who experienced abuse and violence from a young age, without the support needed, I naturally carried much of the results into my adulthood. Because of my lack of deep-seated awareness of how to change the impact on my choices and behavior, even after working with a psychologist for a year and a half to deal with some of the suppressed emotions, it was not until my research and introspection connected all the dots, developed The Respect Principle concept, and kick-started the process of making the healthier choices and changes made possible by increasing my Respect Level. Once focused on my victimization, a rage consumed much of my emotional energy and even manifested physical symptoms that lead to physical ill health. The rage also spilled out onto my relationships, personal and professional, and in retrospect, I see how I lashed out at people with my anger, often using cynicism and sarcasm as weapons against the people in my present, who were not necessarily the ones that inflicted the original pain or even present pain, at least, not consciously and intentionally, but again, we attract people who will inflect their pain their way, which can even be through non-acceptance and ostracization. What this has to do with Ghomeshi and the women who accused him of physical harm is they too were operating at the same low Respect Level. Experiences, combined with the cultural philosophy people have to earn respect rather than respect being a principle, applicable to everyone, have impaired their Respect Level, so Ghomeshi may have acted out his rage in bursts of inflicting physical pain and the women accepted the behaviour because of their distorted sense of needing to have a relationship with someone who hurt them … which is why Ghomeshi carried on the behaviour … because the women did not complain or leave, but instead stayed connected … typical in many abusive, controlling, manipulative relationships whether romantic, sexual, work-related, etc. That is, until they were discarded by Ghomeshi or began to wake up and raise their Respect Levels and subsequently went public with accusations against him, also not in a healthy respectful or even legal way, it may also appear. Once a victim, repeatedly, I understand the outrage the women, the accusers and their supporters, felt about the unfairness of the results. But for everyone’s safety, we cannot throw out the concept of reasonable doubt when it is convenient for our desired outcome. The judge really had no choice, based on the subsequent behavior of the women after the alleged violence, but to dismiss their claims, even if true, because their behaviour revealed what many would call instability, a result of previous abuse or violence or even a level of insanity. I call it low Respect Levels … a way of thinking and acting that impairs one’s ability to make sound, healthy choices based on positive role modeling. Ghomeshi’s behaviour also stems from a low Respect Level, in part developed by the global philosophy of disrespect, especially against women, and however his own experiences shaped his thinking. Unfortunately, because the women did not stand up to his initial actions that offended, scared or hurt them, permission was given to him to continue with them or with others. My heart goes out to both sides for their pain and my hope is that for all involved the personal work that needs to be done gets done, so everyone can move on in a healthy way. Forgiveness is also part of the healing process, and though not easy at first, I know healing and peace can only be attained with forgiveness. Does that mean we should forget what is said to have transpired? No. It means we work together, not to change the legal system some conjecture failed the women, but to change the mindset, the philosophy … the principle that defines some people as worth of respect and others not … that fails women and any vulnerable person. Educating and inspiring us all to increase our Respect Levels for each other … for all of us … is the compassionate answer to the change we seek. Made the Second Round of the Competition! Congratulations to the 20, of which I am 1, that made it to the second round of the Hawk’s Nest angel investors contest! Will I make it to the third round … if it is God’s will! Regardless, yesterday’s meeting with Barb and Rose certainly ramped up the possibilities because of their shared experience and wisdom that I can use going forward with the social business venture and global initiative … wherever and with whomever it leads me to in order for the next phase to happen. Thank you Barb and Rose and the angel investors, the Hawks, for this opportunity! Greetings! My name is Kaitlin Ann Trepanier … The Respect Specialist, Humanitarian, Social Entrepreneur, Publisher, Author, Creative, Speaker, and Developer of the social business venture delivering the Connecting the Dots … with The Respect Principle … the powerful global initiative transforming lives by empowering people with the logical, practical, and compassionate core concept. Ever Heard the Whole “Sodom” Story? Raised and educated in Catholic churches and schools, my memory recollects the focus of the story of Sodom and Gomorrah as the cities God annihilated because of sexual perversions. Yet, since reading the Bible myself, I discovered the whole “Sodom” story in Ezekiel 16: 49. To respect copyright law, I’ll paraphrase. Basically because Sodom citizens were prosperous they ate what they wanted, did what they wanted, which included doing nothing or only leisure activities for their own pleasure … plus they did nothing to help the less fortunate either which angered God enough to destroy them all. As a returning Christian believer, I am grateful for the opportunity to learn God’s teachings uncensored or sullied by interpretations, some with good intentions, but many others to create their own following in order to reap the benefits themselves. Regardless of my own spiritual beliefs though, from a logical, practical, scientific perspective of cause and effect or a general metaphysical belief of karma or what goes around comes around, the same message is clear … self-centeredness and overindulgence with food and activities for our own satisfaction only, will manifest our own demise, individually and collectively … either through God’s direct hand or through the more subtle methods of social, economic, and environmental disasters and collapses. This is not the world I want to live in and die in, want for my loved ones, or anybody … and probably not the one you truly want either … for yourself and your next generations. Self assessment is a good thing, as is growing into wisdom from the knowledge gained directly or from others. It also demonstrates a higher than lower Respect Level. 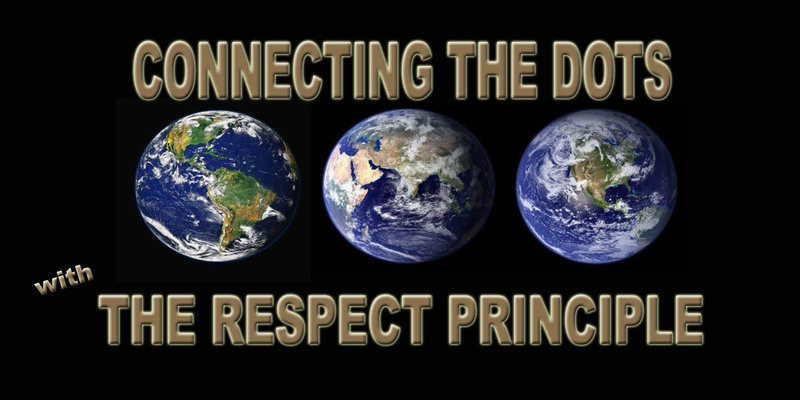 And it is more rewarding than you may think it would be … Connecting the Dots … with The Respect Principle. Want More Time to Focus on What You Want? Want more time to focus on what you want or to discover what you really want for your life? For me, the lightbulb went off when I realized who and what I was jealous and envious of by my thinking to myself “Well, I could do that … maybe even better.” Who was I was jealous and envious of … acclaimed writers, artists, business executives, philanthropists, and advocates … all of which I am becoming by consistently and continuously developing my inherent abilities, gathering new knowledge, and learning new skills. For others, dreams could be being a parent, a community volunteer, coaching … whatever does not matter … what does matter is doing what you can with what you have to work towards the goals … now … realizing all the small steps will one day get you to where you want to be. The thing is though, in order to have the time and energy to do so, we have to give up focusing on what others have that we want … even stop judging how they are doing it and their results, so we can redirectt that energy to accomplishing our own dreams and goals. This course of action does not mean there will not be challenges and obstacles, but it does mean you will be happier and as a result, more motivated to stay focused on your … not other people’s … paths. I know. because It is working for me. Best wishes to you and yours! Reclaiming All Talents … Time to Soar! An ease and fascination with numbers has always been with me. Arithmetic was my best grade school subject, though writing was my favorite subject: one I had to work harder at, though the spelling of words came as easily as working with numbers. As my grades and enthusiasm deteriorated from A’s to B’s, C’s and slipped to a D in grade nine, no one asked what was really wrong. The standard testing of the time revealed a mind contrary to what was happening with my marks and attendance and my ability with numbers motivated them to put me on a course for business and science. University-bound they said I should be, but I could not grasp why I had to learn stuff that was so far removed from what I needed at the time, and in fact, was making life worse for me, though I did not fully understand why till many years later. When I left high school in the middle of grade ten, it was not simply to marry just after I turned sixteen, but to leave behind problems I did not know how to address in a healthy, positive way and naively thought would be resolved by leaving school and marrying, which, of course, they did not. A few years after marrying found me on my own, with no husband, no support, and no education, but back then, not having a high school diploma was not crucial to the factory and retail jobs I was hired for easily. Inherent leadership, organizational, and a strong esthetic sense for merchandising quickly landed me into merchandising, administrative and supervisor roles by age nineteen, when I became a department head for a chain store, then assistant manager by age twenty-one. After organizing a staff walk-out because of an area supervisor’s sexual comments and advances to many of the staff, I quit and accepted a part-time job at a local grocery store. A new owner arrived and within weeks, I became head cashier, and then the owner’s office assistant by age twenty-two. After what had happened in school, I was surprised by all this because I had become convinced by that experience and others that I was not too bright. Defiant, yes, but not bright. That is, until the years rolled by and I began working with the chartered accountant to help prepare for the compilation and preparation of the year end financial statements. Encouraged by the accountant, I prepared and successfully completed the grade twelve equivalency exam and applied to a business school with the intent to become an accountant. So, at age twenty-nine, I joined a group of mostly high school graduated, and with honors, graduated from Westervelt College with the other distinction of being the Chi-Eta scholarship recipient for Outstanding Student Cooperation. While attending, I was also elected as the school newspaper editor and treasurer. And yes, my best marks were in my business mathematics, bookkeeping, and accounting courses, while my worst was English. A move to Toronto resulted in a job in the accounting department at Howard Johnson’s head office, but quickly I discovered that the repetitive structure of accounting bored me and the location was a long commute from the other side of Toronto. Recruited next by Levi Strauss & Co. (Canada) Inc., seven years not only provided a wealth of opportunity working in business planning, operations, and human resources, but also the opportunity to observe big business in action. Disenchanted, which as it turns out, not because of the company, but because of still unresolved problems, plus motivated by a corporate culture that encouraged continuing education, I applied for, and still shockingly was accepted into York University’s Bachelor of Science program with the intent to acquire a Ph.D. in psychology. But what happened totally took me by surprise! Though the psychology and biology courses were interesting, what captured my heart most were philosophy and humanities. Reading the wonderful books, some of which I had missed by not attending high school, blew my mind wide open. No longer did I want to help people by only becoming a psychologist, listening to people in counselling sessions, I wanted to help them by becoming a great writer. Having to write the essays for these courses revealed what my earlier English marks had not. As my university marks revealed, I truly did have an inherent ability to write, even well, though admittedly, it was the technical skills I needed to develop. Stunned by this revelation, I left university with the goal to write for a living, though there was much I needed to learn. Nonetheless, in those few years after leaving almost seven hundred poems, forty short stories and essays, plus my first stream-of-consciousness book literally poured out of a very deep well. Some works sold, though many were young in voice, unpolished, unsophisticated, and even childlike. But the little confidence, deflated by a lack of encouragement from families and friends, motivated me to abandon writing and turn to studying design, communication and visual arts, while I worked with numbers again to live. The desire to write though finally burst forth again. I wrote and recorded the children’s story, Charles’ Choice, that a few years later I sold as a workshop to a school board. A year later, I entered a local writing contest and was awarded Honorable Mention, Literature, selected by a York University professor. Finally, I knew what I was to do. Now, several years later, with several books written and more in research and development, the time has come to also return to incorporating my inherent numerical and leadership skills, along with the dream of helping people with my writing … which is why I am refreshing my accounting principles knowledge and am excited again to be working with numbers and formulas in preparation to reach out globally with my company. In fact, one of my goals is to also explore the world of abstract mathematics … for fun! Anyway, the upcoming local Hawk’s Nest angel investors competition was just the catalyst I needed to embrace the whole me as The Respect Specialist, social entrepreneur, creative, and writer. The experience of feeling put back together … all of me … is one I highly recommend to anyone who, for whatever reason(s), buried parts of who they truly are. Like me, respect yourself enough to set yourself free of the limitations placed on you … and SOAR!